Below are a special selection of wedding flower packages using the most popular bridal blooms. These packages have been designed to make choosing and ordering your wedding flowers as simple, cost effective and stress free as possible. It’s just a matter of click and go. Remember to fill in the information form after you’ve completed payment. 1 x beautiful classic hand tied wedding bouquet of roses and a little foliage. 2 x simple rose bouquets for your bridesmaids. 5 x matching rose and foliage buttonholes. 2 x Aqua packed hand tied ‘thank you’ bouquets for the mums (best available seasonal flowers). 2 x Simple hand tied gerbera bouquets with grass and folded leaves for your bridesmaids. Choose from: Ivory, pink, red, orange, yellow, peach or burgundy. 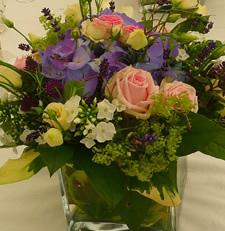 Gorgeous, scented seasonal flowers arranged in low glass vases (on hire). Choose from pink and purple, white and cream, yellows and orange or reds. 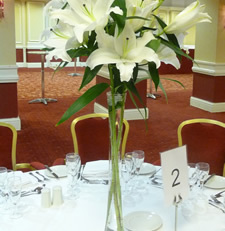 6 x Large fish bowls (vases on hire) of floating gerberas with swirls of grass and clear crystal in the base of each vase. 6 x Hurricane (vases on hire) filled with fresh rose petals and a long burning candles set on a mirrored plates. 6 x 60cm Tall lily (vases on hire) filled with tall scented oriental lilies and steel grass with a little foliage. Mirrored plates (for your reception vases) with 3 tea light candles in glass holders are £3.25 per table to hire with any package. Table scatter crystals are available in: clear, pink blue, purple and black and priced £2.50 per table. Delivery is free to a Brighton address- other delivery areas are possible, please phone for a price or you can collect. A deposit must be paid for all hired vases. Deposits for hired equipment are refundable upon satisfactory return of hired items. Payment of deposits and booking fees are acknowledgement of Terms and Conditions. If items are returned late, or after the agreed period, a penalty charge is payable by the client at the same rate of hire per item per day until returned. Any damaged or missing items will be charged for– The Hirer (you) shall be solely responsible for the Hired Goods not the reception/event/venue/hotel/florist or any other third party to whom shall take possession of the Hire Goods. The Hirer shall be alone responsible for insuring the Hired Goods are kept in good order from the time of receipt of delivery until back into the possession of the Hiree (Blooms for Business). Therefore agreement of a good provision of storage must be made and organized directly with any third party involved for any hired goods if you are leaving at the venue prior to our collection or your own return delivery on the agreed date. The goods must be packaged in the boxes provided ready for collection/return. Blooms for Business reserves the right to change the contents of vases/arrangements with flowers of an equal or greater value without notice. All products/services/vases and flowers are subject to availability. While we are generally happy to remove and dispose of event flowers when collecting our vases, in the case of large events (over 15 tables) or stage designs or giant floral marquee balls there may be a charge levied for the breakdown and removal of flowers/oasis etc. (unless stated otherwise on your quotation). Please note that no flowers will be ordered until full payment is received (cheques take 7 working days to clear).